The Ys (pronounced “eese” as in geese) series of games have a long and storied history, stretching right the way back to 1987, when the first game was released on that well known gaming platform, the NEC PC-8801. Through the years, the series of games have appeared on almost every platform imaginable, from the Master System and NES, through Playstation and now onto current gen hardware. This particular game, Ys Origin, is, as the name suggests, a prequel to the previous eight Ys titles, taking place 700 years before the first game. It has been kicking around since it was released on Windows way back in 2006, and now DotEmu have chosen to release it to the Xbox One world. So, has the time been kind to the world of Ys, or should it have stayed in the past? The story of Ys Origin is suitably bonkers. Ys was a prosperous, peaceful land, ruled over by twin goddesses, Reah and Feena, with magic freely available to all, dispensed by an artifact known as the Black Pearl. 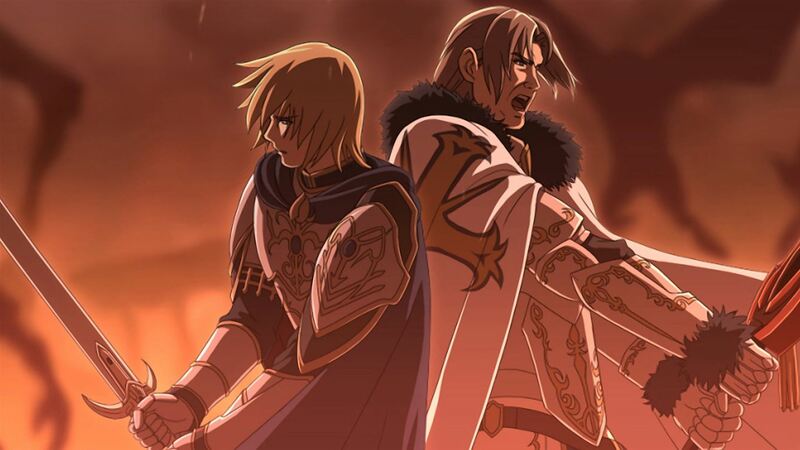 Then, one day, Ys was attacked by giant demons, with no warning and humanity was quickly overwhelmed, with the combined might of the Holy Knights and Sorcerers unable to stem the tide. 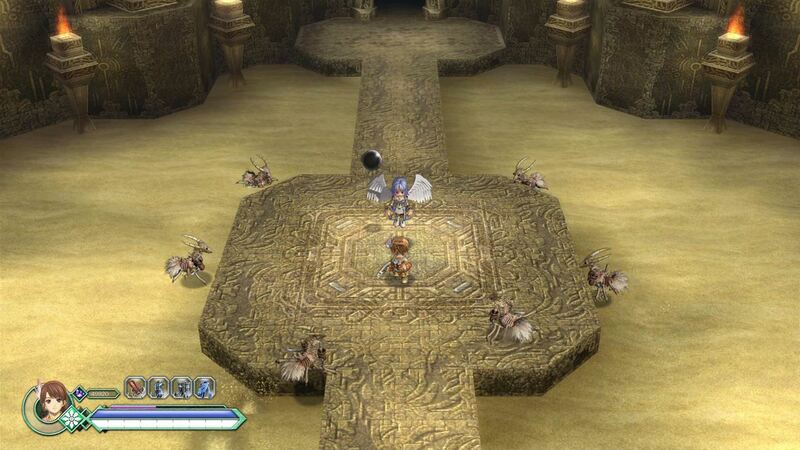 The people of Ys were quickly pushed back and confined in the Solomon shrine, the holiest temple in Ys, conveniently placed on top of a mountain. In a last ditch effort to keep the temple safe, the Twin Goddesses used the power of the Black Pearl to rip the temple from its roots and levitate it into the sky, out of reach of the ravening demon hordes. So far, so good, right? Well, the demons are nothing if not determined, and so they constructed an enormous Tower, and the war continued, with them launching aerial attack sorties from the Devils Tower, as it came to be known. As the battle raged, it was suddenly discovered that the Twin Goddesses had disappeared, and even worse, the Black Pearl was gone as well! The only place they could have gone was to the Devils Tower (the rest of Ys being a smouldering ruin) and so a rescue mission was quickly organised, with the elite of the Holy Knights and Sorcerers being sent down to the surface in a transport spell. Unluckily, as they were travelling to the surface, the transport spell itself was attacked and disrupted, scattering members of the search party far and wide. It is at this point the story of Origin starts. This leaves you with the choice of two characters. Yunica Tovah is an apprentice knight, with no innate magical ability. Her style is to get right up to enemies and introduce the pointy end of her axe into their faces; as such her mobility and speed are both high. Hugo Fact is a magic user, shooting magical bolts from a distance to bring the pain, and he also has his “Eyes of Fact”, for all the world like orbiting turrets that also fire magic at the enemies. As a ranged fighter, his mobility and speed are slower, but he makes up for it being sniping from a distance. There is a third character to be unlocked too, known only as “The Claw”. In an interesting move, each character has not only different attacks and strategies, but a separate story line to discover. The grand arc is the same, but the order in which NPCs are encountered changes, and the dialogue is also different. This helps keep the interest high for repeated playthroughs. Completing the game will also unlock new game modes, including an Arena mode, Time Attack and Boss Rush modes, which help tremendously to keep you playing. The Dark Tower has many floors to explore, and as you would expect, there are lots of boss demons to overcome on the way to the top, not even counting the many demons littering the place as you try to get the lay of the land. Destroying these creatures awards your chosen characters with EXP, which is used to rank up, and also SP, which can be spent at the Goddess statue save points, allowing you to buy upgrades that will make your life easier. These range from powering up the armour you are currently wearing (new sets can be found off the beaten track, and powered up again) to reducing the MP cost for using spells to reducing damage from the environment. All these things are exceedingly useful, and saving up enough SP can be a real challenge, as some of the abilities cost upwards of 250,00 SP! Luckily, each time you leave a room, the monsters respawn, so finding a good grinding spot will help you immensely. The best spot of all is the final section before the last boss, but getting there requires quite a lot of effort. Ys is one of those games where if you are slightly over-levelled, it will help you breeze through things. A bit of time investment is certainly recommended. 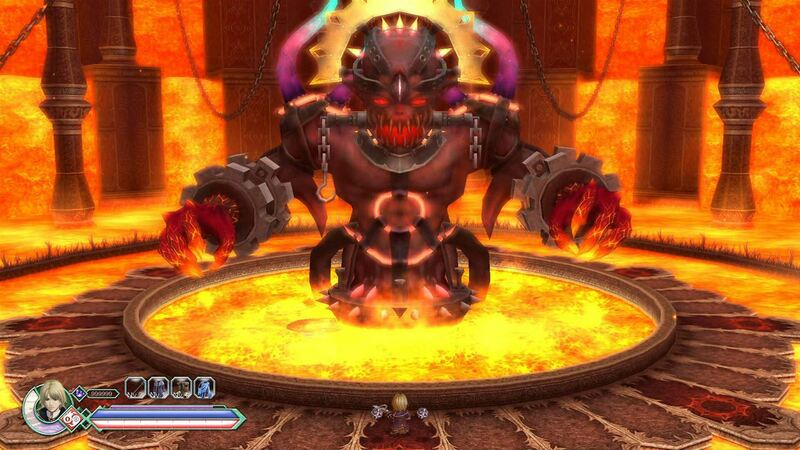 Being over-levelled will also help with the bosses, which in the grand tradition of JRPGs are screen filling affairs, with complicated attack patterns to memorise and seemingly endless health bars to whittle down. These are a real test, not only of your co-ordination and pattern recognition skills, but of your patience as well. There are sometimes issues with positioning your character on the screen, which can lead to some cheap feeling deaths, but these can be overcome with practice. A good example of this is the first boss creature you come across. He is a funny looking thing, with a wide base, skinny body and a large head, and two long arms. The tactic is to damage his base until he becomes dizzy, at which point a flap opens on his head, revealing his weak spot, the brain. You have to run and jump up his arms to get there, and depending where they are, the game sometimes interprets your directional inputs slightly wrong, causing you to fall off the arms and the whole procedure to then begin again. As he only stays stunned for a short time, this can cause the fight to take longer than it should, and is frustrating. However, when you do overcome a boss, the feeling of elation is one of the purest hits of joy I’ve had from a game in a long time. The knowledge that Ys Origin is a game that doesn’t pander to the player, and that you have beaten the boss, makes all the struggles fade in comparison. Graphically and this is a beautiful throwback to the Super NES days, with gorgeous sprites moving around, animated beautifully and even managing to portray emotion in the cutscenes. In one tragic cutscene that I won’t go into detail about because, well, spoilers, the raw sorrow that is shown just by the slump of a character’s shoulders and they way they fall to their knees is almost too much to bear. The backdrops are very well drawn, the monsters are imaginative and all have distinct attack patterns and animations to learn, adding to the air of a quality product, crafted by people who care. The sounds are similarly good, with some beautiful music to listen to as you meander about the place; the sounds from the bosses in particular are scary and very atmospheric. The gameplay on display here is perfectly judged – not too hard but still a real challenge – and above all a really fun experience that drives you on to see the rest of the story and explore further. Finding all the gear, the extra magic, and the jewels to power the magic up, all adds up to create a fantastic experience. Obviously if you find Normal too easy, the difficulty can ramp up all the way up to Nightmare, but my ageing fingers found Normal just the right amount of difficulty. There are a couple of dark clouds on the horizon of Ys however. The aforementioned trouble with judging where your character is on the screen raises it head outside of boss battles too. 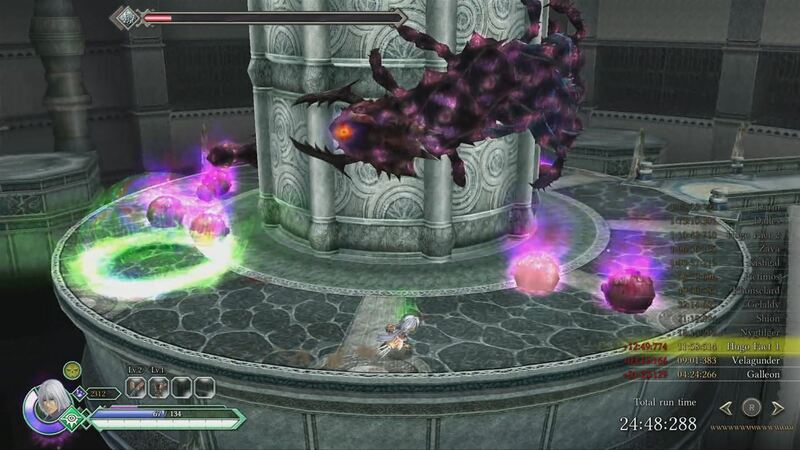 Several enemies fly around the rooms as you try to fight them, and while you can jump and attack, lining the enemies up is almost impossible, especially if they are on a higher or lower platform. Targeting their shadow works better, and once you’ve adapted to that idea, it isn’t too much of an issue other than to occasioanlly be annoying. The only other issues revolve around the save points; they are few and far between, as befits a game that doesn’t hold your hand. The problem is that there is inconsistency in regards the respawning when you die. A lot of the time, you just respawn at the last save point you have used, but sometimes you’ll find yourself at the start of the room you just entered. Having a consistent approach to this would remove the uncertainty. To be absolutely honest though, I am scrabbling somewhat to find bad points about Ys Origin, as the overall experience is so much fun. If you are after a retro JRPG, this is the game for you. It is challenging, beautiful, has a compelling story and memorable boss fights. What more could you need?